Eerie, Indiana was an early 90’s TV series that aired on NBC on Saturday mornings and was pretty much The X-Files for kids. Marshall Teller and his family have recently moved to Eerie, which is statistically the most normal place in America. Little does the rest of the world know that Eerie is in fact the center of all weirdness for the entire world. 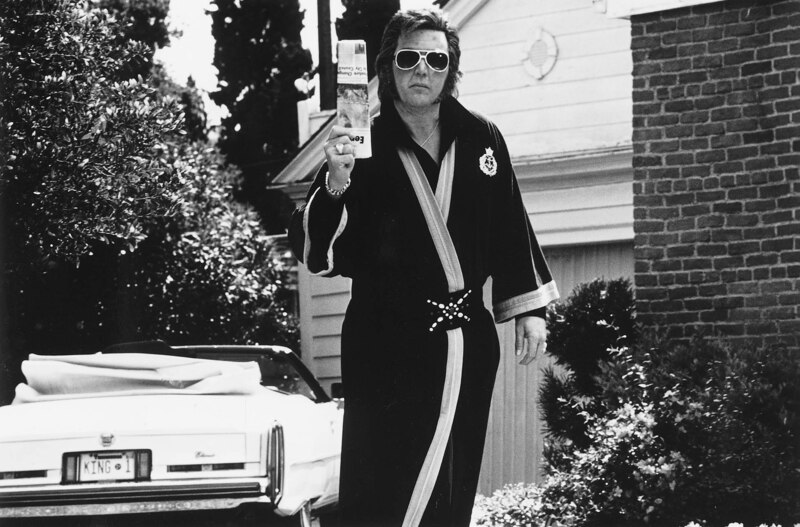 Along with his friend Simon, Marshall investigates all the weird happenings in Eerie like Bigfoot, Elvis living as his neighbor and more. Lasting for two short seasons, Eerie, Indiana was a cult favorite that led to it’s syndication on FOX Kids in the late 90’s as well as a spin-off called Eerie, Indiana: The Other Dimension. The Other Dimension would share the same fate however and be cancelled after one season, though not before a final episode that crossed over with the original series. I know what you’re thinking. 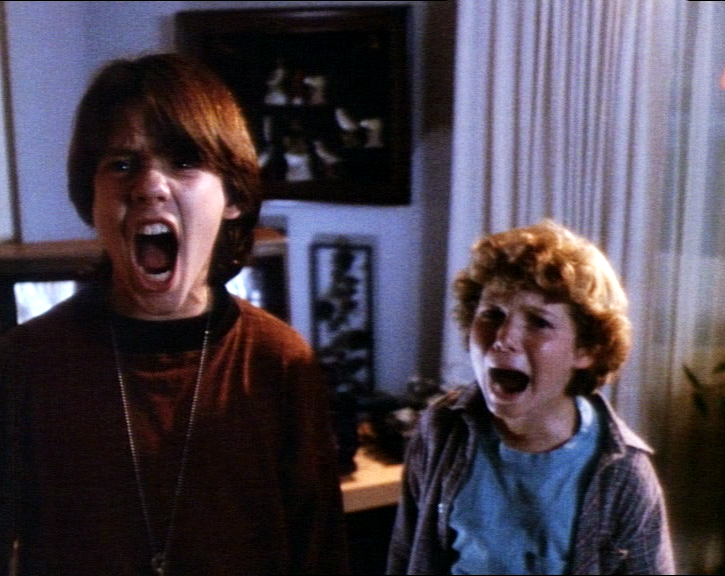 If Eerie, Indiana is like the X-Files for kids, how can ONE episode be more Halloween oriented than the other? Well, in this case it’s the pure and simple fact that “America’s Scariest Home Video” takes place on Halloween night. When Marshall’s Dad gets stuck on the side of the road, the boys are forced to baby-sit Simon’s little brother, Harley, until their parents return. Deciding the best way to spend their time is by staging a funny video scenario to win $10,000, they hook up their video camera to the TV and accidently send Harley into the Mummy movie “Bloody Revenge of the Mummy’s Curse” on TV when he bites down on the remote control. Now with Simon’s little brother stuck in the movie, naturally the Mummy comes to the real world. Marshall and Simon have to get Harley out while avoiding being thrashed by the Mummy and not disturbing Marshall’s sister while she studies upstairs. After finally catching the Toilet Paper wrapped monster, they realize that in fact they haven’t pulled the Mummy out of the movie, but the actor, Boris Von Orloff, that plays the Mummy, and after 50 years of repeats he wants a vacation. Meanwhile in the movie, Harley is terrorizing the movie set and causing the constantly screaming actress to, well, scream some more. With time ticking down as Marshall’s parents get closer to home, the boys stuff the remote into the Boris Von Orloff’s mouth and send him back into the TV and bring Harley back to the real world. One of the last images of the episode is of Boris as the Mummy with sunglasses on a beach with two girls in bikini’s, finally getting the vacation he wanted after 50 years of repeats. Omri Katz, Tobey Maguire & Justin Shenkarow. Eerie, Indiana starred Omri Katz as Marshall, who would go on to star in Disney’s Hocus Pocus as Max. Guests on the show included a young Tobey Maguire, Jason Marsden who fans of shows like Boy Meets World and Step by Step will easily recognize as well as Gomez Addams himself John Astin as Mr. Radford. Eerie, Indiana was a great show that I looked forward to as a kid. It still holds up today as being both a tongue-in-cheek poke at scifi shows but able to have serious episodes as well. Do yourself a favor and watch it on DVD, Hulu or Netflix Instant! "Thank you little paper boy." 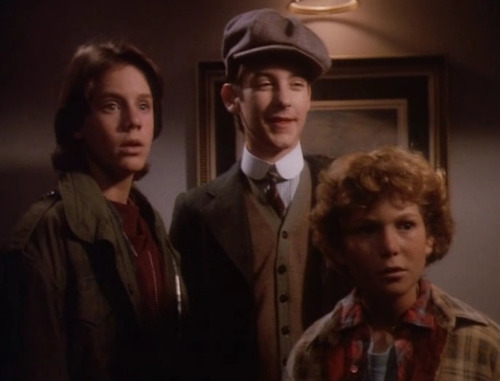 PETER loved Eerie, Indiana and still gets a kick out of a lot of the episodes. That and hearing the line from Elvis at the beginning of every episode will NEVER get old. ← Enter the BEN10: Become a Plumber, Save The Universe Sweepstakes!